Your BIOS version number isn't something you need to keep tabs on at all times. The main reason you'd want to check what version it's at is if you're curious if there's a BIOS update available. Like most things in the technology world, your motherboard software (BIOS) occasionally gets updated, sometimes to fix bugs and other times to add new features. As part of some hardware troubleshooting processes, especially those that involve new RAM or a new CPU that won't work correctly, updating BIOS to the latest version is a good thing to try. Methods 1 and 2 are best if your computer isn't working properly. They are operating system independent. 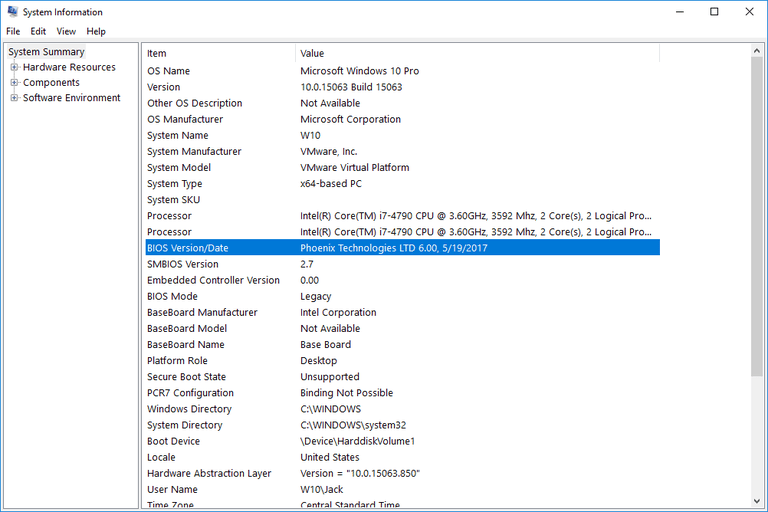 Methods 3, 4, 5, and 6 are more convenient ways to check the BIOS version, require your computer to be working, and work in Windows 10, Windows 8, Windows 7, Windows Vista, and Windows XP. The "traditional" way to check the BIOS version on a computer is to watch for the version notation that appears on the screen during the POST as your computer starts to boot. Restart your computer normally, assuming it's working well enough to do that. If not, kill the power manually and then start the computer back up. If your computer is off right now, powering it on normally will work just fine. Carefully watch as your computer first starts and note the BIOS version that's shown on screen. Some computers, especially those made by major manufacturers, show a computer logo screen in place of the POST results, which is what contains the BIOS version number. Pressing Esc or Tab usually removes the logo screen and shows the POST information behind it. If the POST results screen disappears too quickly, try pressing the Pause key on your keyboard. Most motherboards will pause the boot process, allowing ample time to read the BIOS version number. If pausing won't work, point your smartphone at your computer screen and take a short video of the POST results that flash on the screen. Most cameras record 60 fps or higher, plenty of frames to step through to catch that BIOS version. Write down the BIOS version number as shown on screen. It's not always 100 percent clear which of the cryptic lines of letters and numbers on the screen is the version number, so log everything that might be. Take a photo! If you've been lucky enough to pause the boot process at the POST results screen, snap a picture with your phone. This will give you something concrete to reference later on. You should now have your BIOS version number. The reboot method is great when you don't have the benefit of a working computer and can't try one of the more convenient methods below. Updating BIOS isn't something you do manually, not completely anyway. In most cases, you'll use a special BIOS update tool supplied by your computer or motherboard manufacturer to do the job. More often than not, this tool will clearly show the current BIOS version that's installed, so even if you're not quite ready to update BIOS, or not sure you need to, the BIOS update tool can be used just to check the current version. You'll first need to locate the online support for your computer or motherboard maker and then download and run the tool. No need to actually update anything, so skip those later steps in whatever instructions are provided. This method works when your computer isn't starting properly only if the BIOS update tool for your motherboard is bootable. In other words, if the BIOS update program supplied only works from within Windows, you'll have to stick to Method 1. A much easier way to check the BIOS version running on your computer's motherboard is via a program called Microsoft System Information. Not only does this method not require any restarting of your computer, it's already included in Windows, meaning there's nothing to download and install. In Windows 10 and Windows 8.1, right-click or tap-and-hold the Star button and then choose Run. In Windows 8.0, access Run from the Apps screen. In Windows 7 and earlier versions of Windows, select Start and then Run. A window titled System Information will appear on the screen. Select System Summary if it's not already highlighted. On the right, under the Item column, locate the entry titled BIOS Version/Date. Depending on how much you don't know about your computer or motherboard, you may also need to know who made your motherboard and what model it is. If that information is reported to Windows, you'll find those values in the BaseBoard Manufacturer, BaseBoard Model, and BaseBoard Name items. Jot down the BIOS version as reported here. You can also export the results of this report to a TXT file via File > Export in the System Information menu. Microsoft System Information is a great tool but it doesn't always report a BIOS version number. If it didn't for your computer, a similar program not made by Microsoft should be the next thing you try. If Microsoft System Information didn't get you the BIOS version data you need, there are several system information tools out there you can try instead, many that are much more thorough than MSINFO32. Download Speccy, a completely free system information tool for Windows. There are several really good system info tools to choose from but Speccy is our favorite. It's completely free, comes in a portable version, and tends to show more information about your computer than similar tools. Install and run Speccy if you chose the installable version, or extract and then run Speccy.exe or Speccy64.exe if you chose the portable version. See What's the Difference in 64-bit & 32-bit? if you're not sure which file to run. Wait while Speccy scans your computer. This usually takes several seconds to a few minutes, depending on how fast your computer is. Choose Motherboard from the menu on the left. Note the Version listed under the BIOS subcategory on the right. This is the BIOS version you're after. The Brand listed under BIOS isn't usually something that's worthwhile to know. The BIOS update tool and data file you need will come from your computer or motherboard maker, listed as Manufacturer, and will be specific to your motherboard model, listed as Model. If Speccy or another "sysinfo" tool doesn't work out for you, or you'd rather not download and install software, you have a couple other methods for checking your computer's BIOS version. A simple command can be used to print the BIOS version in Command Prompt. You might try this before the slightly more advanced method below, but only after trying the graphical programs above. There are multiple ways to open Command Prompt, but in most versions of Windows, you can type cmd in the search bar or Start menu to find it. In all versions of Windows, executing the same command in the Run dialog box (WIN+R) works, too. You should see the BIOS version appear just below the command you entered. You can also enter the systeminfo | findstr "BIOS Version" command into Command Prompt to find the BIOS version information as its reported in the System Information tool explained above. Last but not least, and probably not that surprising to those of you in the know, a lot of information about BIOS can be found logged in the Windows Registry. Not only is the BIOS version usually clearly listed in the registry, so is often your motherboard's maker and your motherboard model number. No changes are made to registry keys in the steps below but if you're afraid you might make unintentional changes to this very important part of Windows, you can always back up the registry, just to be safe. From the registry hive list on the left, expand HKEY_LOCAL_MACHINE. Continue to drill deeper inside of HKEY_LOCAL_MACHINE, first with HARDWARE, then DESCRIPTION, then System. With System expanded, select BIOS. On the right, in the list of registry values, locate the one named BIOSVersion. Surprise...the value on the right is the BIOS version that's installed right now. Write down the BIOS version somewhere, as well as the BaseBoardManufacturer and BaseBoardProduct values, if you need them. The Windows Registry can seem scary but so long as you're not changing anything, it's perfectly harmless to dig around. Did you accidentally make changes in Windows Registry? It's easy to reverse them if you backed up the registry to a REG file. see How to Restore the Windows Registry if you need help.